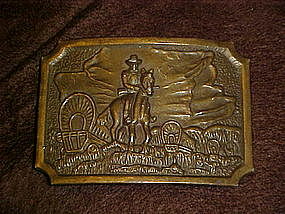 Solid brass belt buckle measures 2 1/2" x 3 1/2". Cowboy on horseback appears to be a scout for the wagon train he is leading west, in the background. Cast relief design. Complete and in very nice condition.